The American black duck often flocks with mallards, in which they look quite similar to the hen. 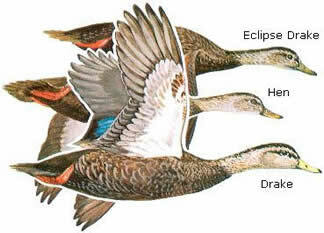 Look for the white wing lining in contrast to the very dark body plumage to differentiate the two. Black ducks have an average length of 24 inches and an average weight of 2 3/4 pounds. A bird of the eastern states, primarily the Atlantic flyway and, to a lesser extent, the Mississippi. Black ducks are a winter resident to the state of South Carolina. 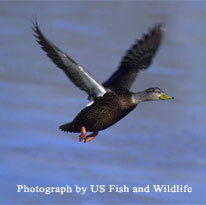 The black duck is more common in freshwater during the breeding season and brackish or saltwater while overwintering. During the winter months they are commonly found in managed impoundments, emergent wetlands, beaver ponds, flooded areas, and fields. Black ducks have a varied diet including plant material, such as seeds, roots, tubers, stems, and leaves, as well as animal material such as aquatic insects, crustaceans, and fish. Pair bonding occurs during the fall and winter months. Nesting occurs on wooded or grassy islands, uplands, marshes, or even cropland. The female digs a shallow bowl in the ground lined with plant material and down feathers. Black ducks lay 6-14 white or cream colored eggs. Drakes kwek-kwek, and hens quack. Similar to those of the mallards.. Shy and wary, regarded as the wariest of all ducks. 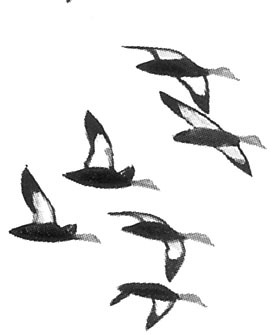 Flight is slow and swift, usually fly in small flocks. Runs, walks, and dives easily. Mated pairs are fairly tolerant of each other during the breeding season with aggressive behavior only arising if a rival male intrudes. Frequently found in small flocks during the nonbreeding season.